Accident and Rescue Summaries. Avalanche Data. “At 11:10 am, on April 10, 2018 the Summit County Sheriff’s Office, Summit County Rescue Group (SCRG) and C-RAD were notified of an avalanche northwest of Glacier Peak – in the vicinity of George Pass – with one confirmed burial. C-RAD was immediately activated and FFL flew in two dog teams (K9, handler and tech), one from A Basin and one from Breckenridge. An additional team was prepared for deployment from SCRG’s incident command. “The two individuals involved in the avalanche were snowmobiling. “At 12:37pm one dog alerted on the subject. Rescuers extracted the individual eight minutes after the dog alert, and the victim was pronounced – injuries incompatible with life – at the scene. “The slide was approximately 2,000’ in length and around 800’ wide. The victim was located approximately 900’ feet up from the bottom of the avalanche at about a 4’ depth. In addition, a large sympathetic slide was triggered in close proximity. There was considerable ‘hand fire’ (unstable snow above the top of the avalanche that had not released) making for dangerous conditions for the rescuers. Within a few minutes after being dropped off by FFL, a C-RAD team had an alert and probe strike. By the time the team dug the victim out, the second C-RAD team was on sight, and the paramedic member of C-RAD was able to make the call – injuries incompatable with life. For the recovery effort, the Good Times (a local snowmobile and dog sled operation) snowcat tried to drive up the road to help, but experienced a transmission failure and broke down in the middle of the road, somewhat increasing the challenge for rescuers needing to use the road. 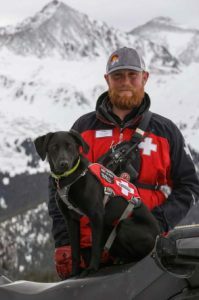 FFL agreed to assist in the recovery and move the body, and Summit County dispatch was called to get Victim Advocates rolling toward Incident Command (IC) to support both rescuers and the second snowmobiler, who was not physically injured, and a friend of the deceased. FFL was also able to retrieve the survivor – the friend of the deceased – and bring him to IC, where an Advocate stepped in and started supporting his recovery. Breck scrambled to put a team together when they heard there was an avalanche, and were able to get safely to the scene. Just a reminder to always call in to FFL as they can only dispatch resources they know they can deploy. However, kudos to Breck for pulling it off. Radios seemed to be a problem on scene. Many teams have old radios that don’t work very well in the field where communication is key to success and safety. Plans are in place to buy new radios for the system. John Reller was at IC and able to dig and hide in a hole for the dogs working the scene, again supporting these critical K9 assets.